Payroll is not only about cutting pay cheques or just clearing bills. It is a deep world inside. A survey was conducted by The National Small Business Associations to understand their approach to handle payroll processes in small business organizations. After analyzing responses from approximately 1,500 small business owners, the research stated that 60% businesses manage their payroll internally and rest 40% of the organizations prefer outsourcing payroll operations to skip all the trouble. Well, is payroll processing really a big time threat for small and mid-sized businesses? Is it fair to pay others for all the work you do? 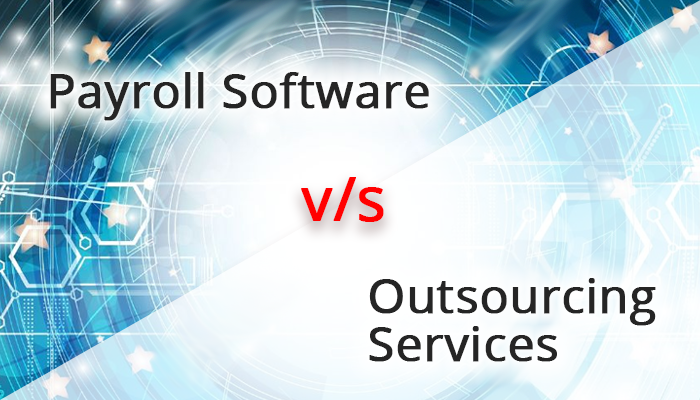 Are employers really scared of making payroll errors that they prefer outsourcing it to enjoy peace of mind? You might not be able to make up your mind for giving answers to these questions. But they are extremely important. Wait a moment and just think again! Did something strike your mind? Let me guess…! MONEY. Saving money, lots of money! Getting an in-house payroll software will definitely help you save money. One time investment will give you ease to work and release stress for many years to come. On one hand where many organizations find outsourcing as a chunky, inflexible and highly expensive process, payroll software makes it easier for SMBs to take complete control of their processes. Let’s us give you few more reasons to favor payroll software. The software makes the process easy, faster and accurate like never before. The data can be accessed anytime without taking help of any person. Payroll historical can be retrieved and accessed whenever it is required. However, outsourcing brings too many complications when past data is needed. The account representative takes days to answer simple questions and it hampers the urgent work. If an organization outsources their payroll activities to a third party, it does not reduce their workload completely. None of the outsourcers tell you that they would be reducing your workload by 100%. While the in-house installation of the software automates all your processes to eliminates the need to put manual efforts. It, undoubtedly, benefits the employer and employee by giving them the peace of mind that they deserve. Once you invest your money in a reliable, scalable and highly functional cloud-based payroll management software, then there is no looking back. You can rely completely on the system to seamlessly carry out all aspects of payroll processing. It saves a lot of time of your employees. The time saved can be utilized in performing core business activities which are equally important and productive.